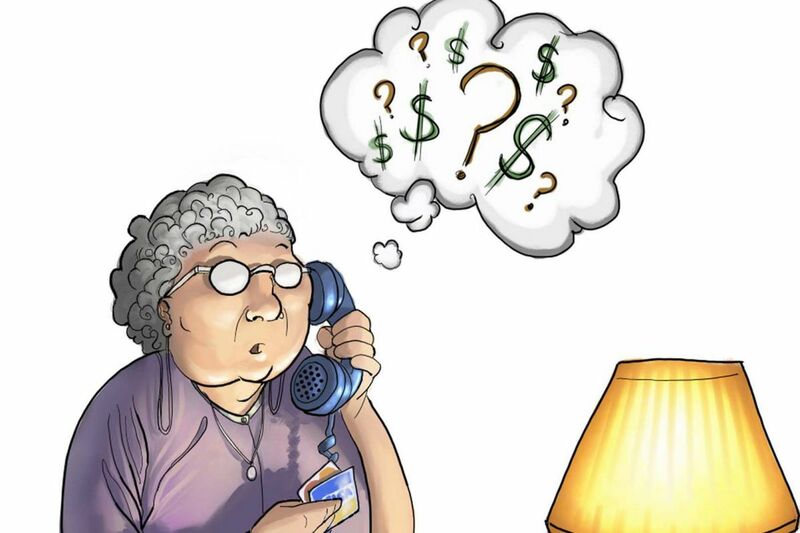 Elder financial abuse includes phone scams, among other ways older adults are separated from their money. Here's a guide for those living in Philadelphia, starting with – believe it or not – the local police, just as you would with any crime. Elder abuse is so rampant that disparate agencies and nonprofits have banded together to form the Philadelphia Financial Exploitation Prevention Task Force. On June 14, the task force and the Penn Memory Center marked World Elder Abuse Awareness Day with an event called "Safe Banking & Financial Management Tips for Seniors." Here's what the task force recommends if you suspect that someone — family or even a senior neighbor — is being abused, neglected, or scammed financially. Your first call should be to 911. The police will check on your relative. There are 35 police districts in the city, and they'll then often refer the senior to Older Adult Protective Services. Your second call should be to none other than Older Adult Protective Services, which in the city is operated by Philadelphia Corporation for Aging. "We operate a helpline that is staffed 24/7, and they have the conversation to find out what your senior needs," said Jennifer Spoeri, assistant director of Older Adult Protective Services. "We start the conversation, visit the senior, do an assessment, and find out what [is needed]. Usually, the elderly person has multiple issues. We'll set them up with meals, home medical assistance, family caregiver support, or domestic care," she said. "For instance, if they kick out the family member who's abusing them, then they need meals and assistance paying bills." PCA and agencies such as the SeniorLAW Center and CARIE (Center for Advocacy in the Rights and Interests of the Elderly) can help with managing finances and hiring a lawyer to serve as power of attorney. The PCA Helpline can be contacted at the following numbers from 8:30 a.m. to 5 p.m. Monday to Friday: English and Spanish, 215-765-9040 (main number); Chinese, 215-399-4944; Cambodian, 215-399-4940; Hindi, 215-399-4943; Korean, 215-399-4941; Vietnamese, 215-399-4942; TDD (for hearing-impaired), 215-765-9041. After Adult Protective Services visits the elderly person, it often advise him or her to get a lawyer to file a "protection from abuse" order, or PFA. That protects the senior from the abuser, who often is a family member. "If they're willing, we refer them to SeniorLAW Center and CARIE," said Spoeri. SeniorLAW Center is a nonprofit organization that provides free legal services, community legal education, professional training, advice, information and referral services, and advocacy to more than 8,000 older people each year, addressing critical legal issues including elder abuse, housing, consumer protection, family law, and health and financial decision-making. Contact the center toll free at 1-877-727-7529 or visit www.seniorlawcenter.org. CARIE, which offers free services to those older than 60 in Philadelphia, provides accompaniment to the Criminal Justice Center; transportation to court; assistance with filing for victims' compensation; connection to benefits and services; preparing victim-impact statements; and restitution assistance. Contact CARIE at 215-545-5728 or 1-800-356-3606 from 9 a.m. to 5 p.m. Monday through Friday, or visit www.carie.org. At City Hall, the Elder Justice & Civil Resource Center, a one-stop resource, is located in Room 278. Opened in October, Pennsylvania's first such center was created as a result of recommendations from the State Supreme Court's Elder Law Task Force. Seniors in need of legal assistance, or who may need an order of protection from abuse, help with deed issues, mortgage foreclosure, tax liens or guardianship can visit the center at any time during office hours, 9 a.m. to 5 p.m. Monday to Friday. Common Pleas Court President Judge Sheila Woods-Skipper oversees the center. "It's a place where seniors can find assistance and the tools they need to navigate the courts, which can be confusing," she said. Woods-Skipper added that she knows of similar centers in only a few other cities nationwide. "We've served roughly 560 clients since October, and 75 percent of those were seniors," she said. "We don't turn anyone away," though the center specializes in assisting those 60 or older. It also helps others, such as families disputing wills or seeking guardianship. For more information, dial 311, email elderresource@courts.phila.gov; call 215-686-7027, 215-686-7028 or 215-686-7029, or visit the website, www.courts.phila.gov/ejc. When a family member falls ill or is incapable of managing his or her own finances, adult children and caregivers may feel overwhelmed taking over. That's where Building Bridges to Wealth (www.bridgestowealth.org) hopes to bridge the gap. The program is organized by the University of Pennsylvania's Wharton School of Business and professor Keith Weigelt, who also teaches financial-literacy classes around Philadelphia for both school-age children and adults. Recently, however, he partnered with the Penn Memory Center to develop a class specifically tailored to the needs of caregivers. The new course aims to inform older people and caregivers about protecting wealth, making investments, seeing returns, managing credit scores, and reducing debt when taking over a loved one's finances. Pilot programs for seniors have been underway at St. Charles Senior Center and the West Philadelphia Senior Community Center. Pilot classes for caregivers will begin this summer at the Penn Memory Center. For more information, contact Tigist Hailu at 215-573-6095 or email tigist.hailu@uphs.upenn.edu.